Configuration for standard racks are welded frame with 4 pillars of 7 Fold profile welded to top and bottom panels. 4 Fold profile depth rails to additionally support the rack. Removable side panels partially vented for better air circulation. Openings/Cut outs for field cable entry from Top & Bottom of the Rack. Vented top cover with fan mounting provision, Front Glass or perforated Metal door with lock and key. Back Vented or perforated metal door with lock and key. Free Floor standing Design with 4 No. castor wheels, 2 no’s with breaks and 2 no’s without breaks. Levelers or Plinth can be provided on request. 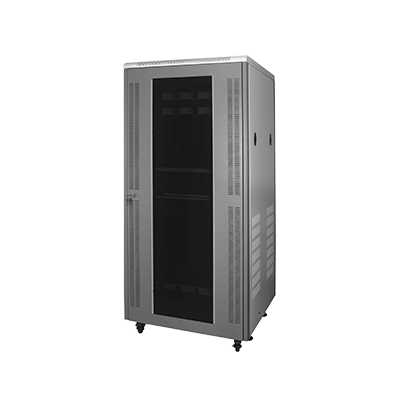 Racks are available in 27U, 36U & 42U Variants with 650mm/800mm/1000mm deep configuration and 600 and 800 width configurations.